Stephen K. Klasko, MD, MBA, is President and CEO of Thomas Jefferson University and Jefferson Health, but Steve Klasko is no ordinary CEO. Steve Klasko has made it his life’s work to imagine and lead an optimistic future for healthcare by challenging the status quo. As a national thinker in the transformation of healthcare, he bridges business, technology, and education as he designs new relationships with patients and their communities. Known for his leadership in the transformation of healthcare, Steve Klasko has been asking tough questions since the 1970’s. Unfortunately, he notes, even today he’s forced to ask some of the same questions about the best ways to serve patients, educate students and organize systems. 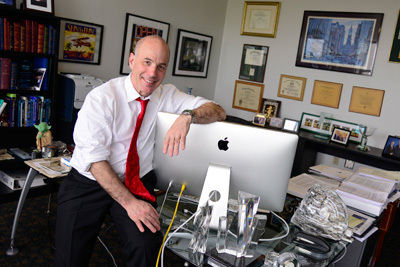 In his role at Jefferson, Klasko has made unconventional decisions that seek to redefine what healthcare will look like, as technology, lifestyles, and ultimately, sociological and economic factors change how modern healthcare providers will best serve people. Steve Klasko is a catalyst for the conversation about the future of healthcare, and can leverage his knowledge, experience, and ideas to lead those conversations to inspire action. Learn more about Dr. Klasko, including his work as a keynote speaker, author, and blogger about the future of healthcare. Dr. Klasko recently spoke with Harold Brubaker of The Philadelphia Inquirer about his new role as Editor-In-Chief of Healthcare Transformation. Dr. Klasko described the publication as "presenting bold visions of the future in healthcare..."
Dr. Klasko was recently interviewed by NBC 10 @Issue's Keith Jones about Jefferson's goal to reimagine healthcare.